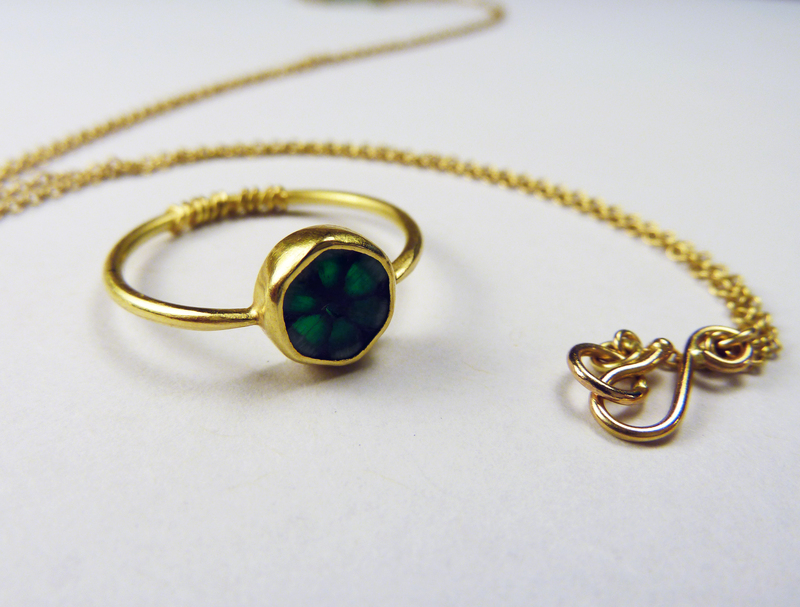 Refine your jewelry making skills in this 8 session goldsmithing course. You will learn about the various alloys and their solders, what to watch out for when heating and cooling, and go over everything from flux to final polish. Fabrication techniques in gold will include hammer forging, using the rolling mill, drawing wire with draw plates, dapped bezel settings, and more. Students can combine gold with silver in their pieces for cost savings and will have the opportunity to melt scrap or new metal to pour ingots for milling sheet and drawing wire. Most students can complete all coursework for this class with 7 dwt of metal. The first day of this course will be lecture and discussion followed by an alloying and ingot pouring demonstration. It is not vital that students purchase supplies and materials before the first session, and any questions about the list will be answered during class. Students will have the opportunity to order metal through Hoover & Strong, a wholesale manufacturer. Basic jewelry fabrication and metalsmithing experience is required. Maximum class size 10 students.